Finding the right process to emboss stainless-steel exterior wall panels challenged Todrin Laser Industries, Inc., Lakeville, MA, when its customer, award-winning Manhattan architectural design firm Della Valle Bernheimer (DVB), came calling with a fabrication job for an exquisite new building design. 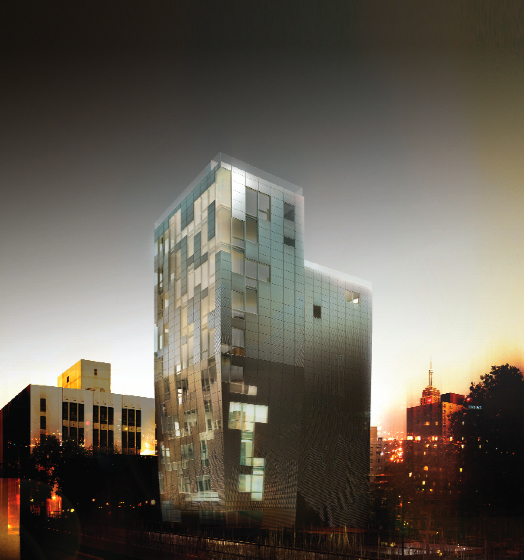 The design called for a singular facade of glass along with irregularly punched stainless-steel panels. The glass and steel combination animates the building by reflecting the changing light and the vibrant New York surroundings of the luxury Manhattan condominium. The challenge for Todrin Industries, a laser, fabrication, stamping and assembly job shop, was to emboss 36 by 60-in. stainless-steel sheets with symmetrical rows of raised diamond shapes across the entire sheet surface. Surface quality was paramount—the finish had to show well with no surface scuffs or other abrasions in, on or around the rows of raised diamonds. Sheet blanks came to Todrin covered with protective PVC film, which the firm had to retain during and after embossing, for surface protection. This posed a potential problem for embossing operations. Also, flatness of the embossed sheet was critical, for appearance and structural-integrity requirements. The flatness requirement proved especially challenging since more than half of the sheet surface required embossing with potential for major sheet distortion. 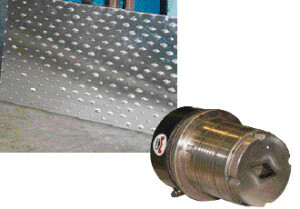 Since Todrin’s existing press proved too small to handle the stainless-steel panels, Nichols contacted Finn-Power (Arlington Heights, IL) for recommendations. This was a first-of-its-kind project and DVB, before moving forward, requested to view actual diamond-embossed stainless-steel sheets that met their requirements. Finn-Power proposed performing a test run of parts on its model C5 Compact Express turret press, using a custom embossing tool supplied by Mate Precision Tooling, Anoka, MN. Initially, Lowry had designed a Mate Ultra Tec tool to emboss 1.4 by 2.75-in. diamond shapes on the sheets—of 0.048-in.-thick Type 304 stainless with a no. 4 finish. The fully guided thick-turret Ultra Tec punching tools are designed to optimize tool life and allow interchangeability with existing tooling systems, according to Mate officials. Finn-Power ran the new Ultra Tec tool to produce 12 full-size sample sheets, which it shipped to DVB for evaluation. DVB architects approved the process, which led to Todrin acquiring the Finn-Power press along with a full suite of Mate tooling. The tooling package included three additional special Ultra Tec tools for embossing 1 by 2-in., 0.375 by 0.375-in. and 0.562 by 1.25-in. diamond shapes in the required row patterns. Todrin’s new turret press features load-unload automation, handling, positioning and stacking of sheets before and after punching, which facilitates the project’s high volume requirements–2000 embossed panels for the initial project. The press includes a 20-station turret expandable to 100 stations. It can punch hole diameters as large as 3.5 in. with accuracy of ±0.005 in. at press speeds to 1000 strokes/min. “Consistency of embossing, not speed, proved to be the key to success with this project,” states Nichols. “We’re operating at below top press speeds to ensure high-quality results because the sheets in the press must line up just properly, and the tools must deliver just the right amount of embossing force. Article supplied by Mate Precision Tooling, Anoka, MN; Tel. 800/328-4492, http://www.mate.com/.